A couple of weeks ago my wife and I began to test two coffee makers. We thought the Chemex coffee was a little better tasting brew than the French Press. We now we have a Chemex coffee maker. We have compared it with our auto drip and can say that the Chemex brewed coffee tastes better. You can see the Chemex here: www.chemexcoffeemaker.com . We were looking forward to trying the Chemex at home. We were also looking forward to brewing the same coffee in both the Chemex and our auto drip and tasting any differences. The coffee we chose to try is Community Coffee’s French Quarter Fusion. It is a medium roast whole bean coffee. We first brewed the coffee in the auto drip to have in the morning. I usually drink dark roasts and was surprised at the good taste of the coffee. It doesn’t really have a strong aroma, but it is good. My wife knew it was different than our normal morning coffee and she liked it too. The next day we tried it in the Chemex. We ground it in a similar fashion and followed the brewing directions. The coffee tasted much cleaner and better. After swallowing the coffee I felt a slight tingling on the roof of my mouth and tip of my tongue. It also had a slight spicy taste to it. My wife liked it better in the Chemex too. She definitely thought it had a slight spicy flavor. She also thought we should get this coffee again. We had it in the early afternoon and she thought it was a light, fresh tasting coffee that was really good for the afternoon. She plans on taking some to work for the people in her office to try. I guess that proves she really liked it. 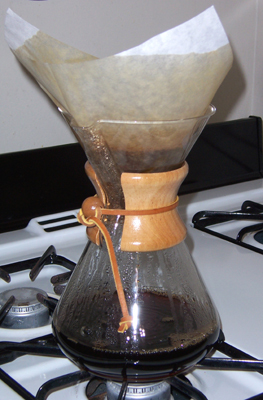 So if you want to brew the cleanest tasting cup of coffee, we suggest you get a Chemex Coffee maker. It easier to use than I thought it was going to be. The only drawback is that it does not hold the heat of the coffee too long. But you can keep the coffee warm on a stove. I don’t like all of the coffees we have purchased from Community Coffee, but I like the French Quarter Fusion and we will get more from them. You can find them here: www.communitycoffee.com . Being a guy, I tried to get this to qualify as a date. It didn’t work, but it does count as doing something together and having fun. Hey, I’ve got to try. I’m looking forward to brewing and tasting other coffees together. Next week we’ll compare a decaf coffee. It should be fun.